Have you ever wanted to try wearing a yukata? 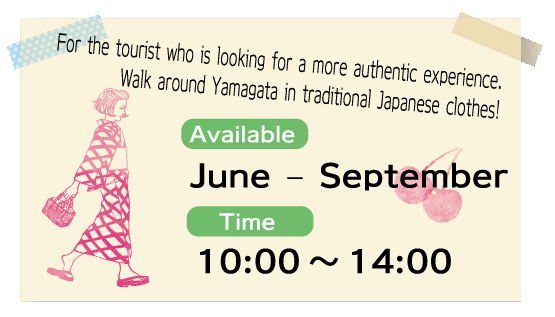 Walk around Yamagata in traditional style! 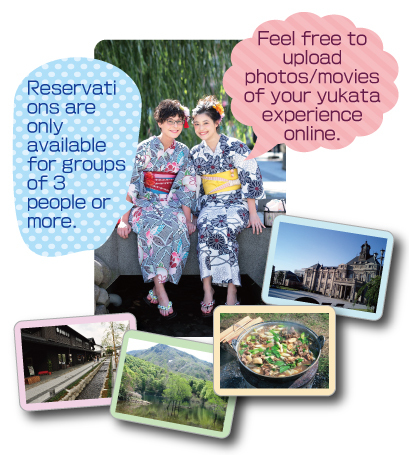 Simple hair styling, makeup, and yukata fitting are included in the dress plan. ※　Please allow us to choose the perfect yukata for you. ※　Small additional items, for example: geta sandals, bags etc. are also available for rental. 14:00 Return to the meeting place, change clothes, goodbye! ※Meeting/changing locations will be advised upon reservation. ◇　Please provide a passport as proof of identity. ◇　We are unable to offer any travel arrangements. ◇　Please organise your own lunch. ◇　In the case of rainy weather, plans are liable to change, or may be cancelled. ◇　all participants will receive a full refund, however once the experience has started, a refund is no longer possible. Once a reservation has been made, payment is expected. ◇　All cancellations must be made one week in advance. Reservations cannot be made for the same day. Copyright (C) 2010 Atelier Muse All Rights Reserved.